Lynette Yiadom-Boakye is probably a household name now thanks to Solange's A Seat at Table album, but many of us art lovers and art makers have been crushing on her for years now. I can't quite remember when I first discovered her work, but I do remember the first piece of hers that pulled me in. It was Mason's Yard. The colors, the composition, and the brush strokes just makes you want to stop and stare. And if you're a people watcher like I am, you can't help but wonder what's on this woman's mind. Is she thinking about her partner being late for their date or the sermon Pastor preached that morning? It's up to you to fill in the gaps of the story. A R T W O R K F A C T: Each of Lynette's paintings are completed in one day. Doing so helps preserve the mood and the artist's stream of consciousness. Two words: prolific. genius. And then there's Complication, the now extremely well-known Lynette Yiadom-Boakye piece that inspired Solange's Don't Touch My Hair song from her recent album A Seat at the Table. Read more about artists inspiring artists over on the CRWN blog. I saw this beauty up close recently at the MET Breuer and one word - OMAHGAWD! Just breathtaking. Mr. Marshall's uber black figures are like magnets - they hook your gaze and pull you in! It's all intentional according to Marshall. Artist on a mission. 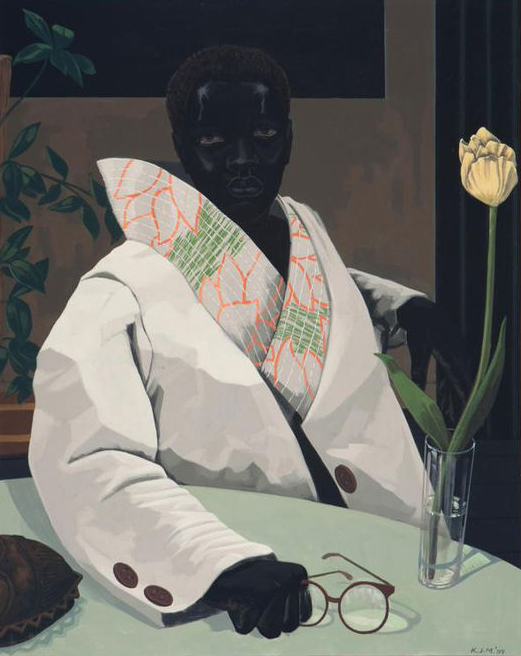 #dope #gamechanger #boss #IwannabedrivenlikeMarshall Ok, I will quit the hashtaggery and leave you will a few more of brilliant works of art made by Kerry James Marshall. A major museum survey of Mr. Marshall's work is currently on view at the Museum of Contemporary Art Chicago (MCA) and will be heading to NYC's Metropolitan Museum of Art this fall (YAY **emoji praise hands**) followed by a final show at the Museum of Contemporary Art Los Angeles in the spring of 2017. If you're anywhere near those cities, RUN don't walk to see Marshall's gorgeous and heavy work. p.s. special thanks to my bestie who joined me at MET Breuer and snapped the picture of me ooohing and aaaahing Marshall's work.